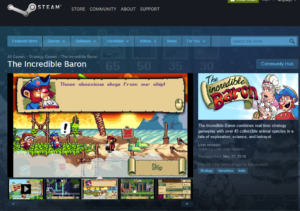 The Incredible Baron is Coming Soon to Steam! Baron will launch on Steam on May 27th! Among other new features added, the Steam version includes a full screen mode, hotkeys, and a unit and ability previously only available to Kickstarter backers. We have officially released the game on each of our currently targeted platforms! If you are interested in reviewing the game or doing a let’s play, please check out our press kit and don’t hesitate to contact us for a review copy of the game. Yesterday I gave a presentation regarding practical Kickstarter tips at the Columbia Geek Culture Gala. Thanks to all who made it, I hope you found the information useful! As promised, you can download the slides below. I might try to type this up into an article at some point. For now, the slides will have to do! Baron Is Funded on Kickstarter! I am excited to announce that we have hit our funding goal! We on the Baron team are truly grateful for each of our incredible backers. Thank you! Remember, if we can manage to hit our first stretch goal of $10,000, we’ll have enough funding to pay for adding three additional special abilities in the game. This benefits every backer who is already receiving the game! Help us spread the word so we can all enjoy this stretch goal reward! Click to Share Baron on Facebook! Click to Tweet about Baron on Twitter! Make sure to spread the word, and please let us know if you encounter any problems, or have feedback regarding the game design, art, etc. We’d love to hear from you! Stylized logo of the Baron created for a wearable button. It’s a bit abstract but I think it looks neat. It would be hard for anyone unfamiliar with the game to understand the meaning unfortunately. I need to put it on a t-shirt so nobody at work has any idea what the heck it means. See what happens when I’m left alone; I redrew the white moai creature to be an animated snowman. It should provide one more unique creature appearance to go with the dozen others. This is the official first post in the Baron dev blog. The big news is that our Kickstarter will be launching soon. Check it out and please send any feedback you might have. This was quite a process, but I think we are finally nearing something good! ©FlatRedBall, LLC. All Rights Reserved.